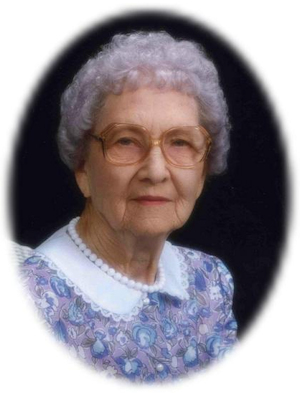 Obituary – Goe, Marie Elizabeth (Rupp) « Perry High School Alumni Association, Inc.
Marie Elizabeth Goe, 98, of Perry, Oklahoma, formerly of Lucien, Oklahoma, was the daughter of Jacob and Luise (Just) Rupp. She was born July 31, 1907 in Noble County on the Rupp homestead south of Lucien and died Thursday, April 6, 2006 at Green Valley Nursing Home in Perry. A life-long resident of Noble County, Marie was a 1926 graduate of Perry High School. She and Frank Michael Goe were married in Noble County on November 28, 1929. Marie was a homemaker, who enjoyed music and gardening. She taught piano lessons for several years. Marie was a member of the Lucien United Methodist Church, where she played the organ and piano for over 50 years. She was also the director of Bible School. Funeral services will be 2:00 p.m. Monday, April 10, 2006 at the Lucien United Methodist Church. Rev. Jerry Perryman will officiate, assisted by Rev. Paulette Albright. Interment will be in McGuire Cemetery at Lucien. Services are under the direction of Brown-Dugger Funeral Home of Perry. Memorials may be made to the Lucien United Methodist Church in care of Brown-Dugger Funeral Home, 1010 N. 7th Street, Perry, Oklahoma 73077. Marie is survived by one son, Elroy Goe of Medford, Oklahoma; one daughter, Alice Marie Mack and her husband, John, of Lucien, Oklahoma; three grandchildren, Cody Mack, Staci Reed and her husband, David, and Tom Mack and his wife, Shelly, all of Lucien, Oklahoma; four great-grandchildren, Kaelyn Reed, Rhett Reed and Whitley Mack, all of Lucien, Oklahoma and Jessica Mack of Stillwater, Oklahoma and a host of nieces and nephews. In addition to her husband, Frank, who died on November 13, 1971, she was preceded in death by her father, mother, four brothers and three sisters.